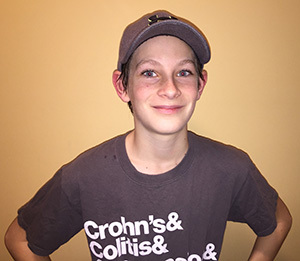 My name is Jaxon, and I am thrilled to be Honorary Chair for the 2019 Gutsy Walk in Windsor. I found out that I had Crohn’s disease in 2016 when I was 8. I had so many terrible symptoms like vomiting, stomach pain, sore joints, blurry vision, pale skin, constipation and extreme fatigue; but my parents and I had no idea what was happening. Learning I had Crohn’s changed my life, but I don’t let it define who I am or how I live. I keep doing the things that I love like playing sports such as hockey, soccer, volleyball, cross country, track and field, basketball as well as, fishing and spending time with friends and family. It’s amazing to think of how many people I have met along this journey, living silently with IBD (Inflammatory bowel disease). Knowing that I have people I can talk with and share my feelings brings comfort and makes me realize I’m not alone. I am so thankful for the health care professionals, my family and friends; I cannot thank them enough for helping me. I would never feel as good as I do today without their support, guidance, care and positivity. My family and friends got involved in the Gutsy Walk 2 years ago as a way for us to contribute to the disease that will affect me for life. Each year, I look forward to meeting people at the walk that are also living with the disease. Every day I hope and pray for a cure for IBD and going to the walk means that we are doing our part to make a difference. If I had to give some advice to others living with inflammatory bowel disease, I would say, be strong, ask for help, stay positive and trust that you are in good hands with doctors because you know your body better than anyone. Answers may not come quickly at times, but we are making huge advances in medicine and getting closer to a cure! I welcome family, friends, co-workers, pets, and people young and old to join us on our Windsor Gutsy Walk on Jun 2, 2019…it is so much fun! In closing, I will never lose hope that someday there may be a cure, and together we can unite and build awareness for this disease which many people suffer in silence.